StarHub retail outlet at VivoCity mall in Singapore; taken October 2018. CEO Peter Kaliaropoulos called it a solid performance amid increasing competition. 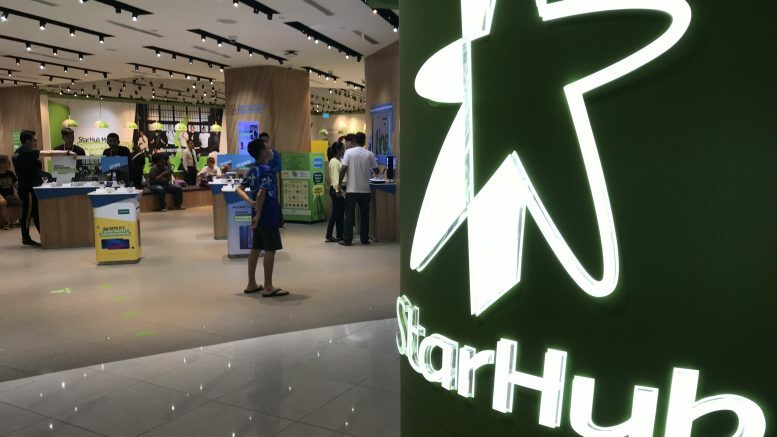 Revenue for the quarter ended 30 September rose by S$17.0 million, or 3.0 percent on-year, to S$582.2 million, while operating expenses increased by S$26.9 million, or 5.6 percent on-year, to S$506.7 million, StarHub said in a filing to SGX after the market close on Friday. “The higher revenue was mainly due to higher revenue from Enterprise Fixed and sales of equipment, partially offset by lower revenue from Mobile and Pay TV services,” StarHub said. It added that cost of sales for the quarter rose 15.5 percent on-year to S$260.1 million, with the cost of equipment sold up 25.7 percent on-year at S$107.8 million on a higher volume of premium handsets sold and sales of smart-home equipment. Service EBITDA, or earnings before interest, tax, depreciation and amortization, fell 12.0 percent on-year in the quarter to S$132.2 million, StarHub said. Mobile revenue fell 4.2 percent on-year in the quarter to S$213.6 million, it said. “This was mainly due to lower IDD, voice and data usage revenue, lower subscription revenue due to higher phone subsidy given to customers, and a higher mix of SIM-Only plans. This was partially mitigated by higher revenue from roaming and mobile value-added services (VAS),” StarHub said. Post-paid mobile average revenue per user (ARPU) was S$44 for the quarter, down from a restated S$48 in the year-ago period, mainly on lower excess data usage revenue from the higher take-up of DataJump, which offers increased data usage, and free unlimited weekend data plans a higher mix of SIM-only plans and a higher proportion of revenue allocated to equipment revenue and recognized in prior periods, it said. The year-ago figure was restated due to accounting-rule changes. StarHub said its post-paid mobile subscriber count rose a net 9,000 on-quarter and 23,000 on-year to 1.385 million. For the pre-paid segment, ARPU was S$14 for the quarter, compared with S$15 at the end of the year-ago nine-month period, amid lower voice and IDD usage, while the customer base fell by 46,000 to 836,000, amid a lower tourist and foreign-worker base, it said. Average smartphone data usage was at 5.4GB for the nine-month period, up 32 percent on-year, it said. Pay TV revenue fell 14.1 percent on-year in the quarter to S$74.6 million, mainly on a lower subscriber base, StarHub said. The Pay TV subscriber base was at 423,000 at 30 September, down by 15,000 on-quarter and 44,000 on-year, while Pay TV ARPU was S$47 for the quarter, down from S$53 in the previous quarter and S$51 in the year-ago quarter, it said. Broadband revenue rose 0.8 percent on-year in the quarter to S$46.8 million, with the segment’s ARPU stable at S$32, both on-year and on-quarter, it said. Enterprise Fixed revenue increased 13 percent on-year in the quarter to S$124.6 million, as Ensign InfoSecurity (Systems), formerly known as Accel Systems & Technologies, was consolidated into results from July 2017 and D’Crypt from January 2018, StarHub said. Revenue from sales of equipment rose 24.4 percent on-year to S$122.6 million, mainly on a higher volume of premium handsets sold and on sales of smart-home equipment, StarHub said. StarHub declared a dividend of 4 Singapore cents a share, flat with the year-earlier level. For the nine-month period, revenue rose 1.1 percent on-year to S$1.74 billion, while net profit fell 17.8 percent on-year to S$181.7 million, StarHub reported. In its outlook, StarHub pointed to its recently announced plan to improve productivity, speed decision making and lower costs, in a move that included around 300 worker cuts. For mobile, it still expected mobile data and VAS subscription would drive revenue, with continued declines in voice and IDD, StarHub said. StarHub said it maintained its guidance for 2018 service revenue to fall 1-3 percent on-year.